Choose a Verine fire and all your expectations will be fulfilled. Elegant, sophisticated and designed to perfection. Verine fires are all this and more. Crafted to not only captivate and beguile, they are built to the highest standards, are energy efficient and perform brilliantly. Verine fires are built to last in our state-of-the-art UK manufacturing facility where our quality standards meet the most stringent demands. That’s why Verine are able to offer an impressive 5 Year Guarantee on all gas fires. Every fire in the range features a Flame Supervision Device (FSD) which detects the presence of a flame, and in the absence of thatflame, prevents uncontrolled release of gas to the burner. For maximum safety each conventional flue model also includes an Oxygen Depletion Sensor (ODS) which shuts off the gas supply to the main burner in the unlikely event of a fault. 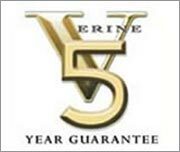 For over 45 years Verine have sold quality products and given quality service, elegance and innovation to the fireplace industry. Specially appointed retailers have been established nationally to display our products, install them and give expert advice to help you choose the correct appliance to suit your needs. We want you to get the maximum benefit from this expertise and therefore recommend you avoid purchasing any Verine product over the internet, especially from companies not located in your area who are unable to offer the highest levels of aftersales service. Control department before leaving our state-of-the-art facility. Fires such as the Da Vinci and Distinction offer a complete fireplace suite in stunning stone, while still offering an amazing 83% efficiency rating, while fires such as the Alpena, Midas and Quasar offer a stunning Verine fire for a standard size opening.